. In the photo, ACE Hardware Philippines VP for Merchandising and Operations Bernard Ong (2nd from left) and ACE SVP- Operations Bernard Lim receive the award from PRA Chairman Lorenzo Formoso and Vice Chairman Roberto Claudio (4th from left). 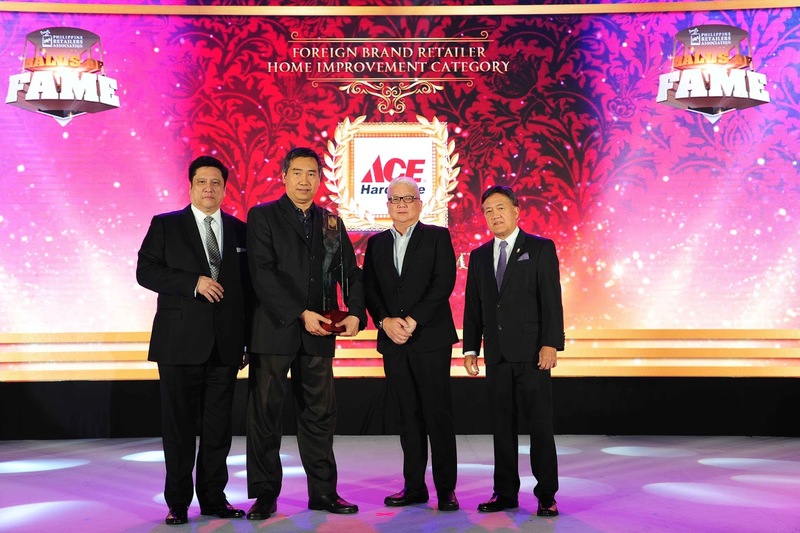 ACE Hardware, the one stop shop for the latest home improvement solutions, was recently elevated to the Hall of Fame in the Foreign Brand Retailer – Home Improvement Category during the Philippine Retailer's Association's 20th Outstanding Filipino Retailers & Shopping Centers of the Year Awards at the Grand Ballroom of Solaire Resort and Casino. ACE Hardware, one of the leading hardware stores in the United States, opened its first franchise in the Philippines at SM Southmall, Las Piñas in 1997. Since then, it has grown to become one of the country's leading home hardware chains with more than 150 ACE Hardware branches nationwide and still growing. ACE Hardware carries a wide range of hardware products and power tools, electrical and plumbing equipment, paints and sundries, building materials, outdoor equipment, and items for the car and the house. It also has a lawn and garden section for gardening needs and a pet section for the animal lovers. This is the third- time ACE has been honored with a PRA Award, thus elevating it into Hall of Fame status. Others include the OFR-Category Killer Award in 2013 and OFR-Best Home Improvement Center Award in 2015. Philippine Retailers Association has over 400 member companies, covering a wide scope of the distribution chain, in its fold — from retailers, mall and shopping center operators to traders/suppliers, manufacturers, distributors, and wholesalers, among others. PRA’s annual search for the Outstanding Filipino Retailers seeks to recognize Filipino retailers who have epitomized the model of a successful retailer in terms of growth and good ethical business practices. I'll have to say that you are doing a very great job in writing good articles like this. I've bookmarked you and will gladly follow your upcoming articles. Always a pleasure reading your articles,so Thanks for that.